ADD A FURTHER FOUR ARENA DATES TO 2015 UK TOUR DUE TO CONTINUED DEMAND! Following a record sell out tour in 2013, rock legends Fleetwood Mac are set to return to the UK in 2015 with their ‘On With The Show’ Tour. Currently on the road in the US, the phenomenally successful ‘On With The Show’ tour is presently clocking in at almost 70 shows across the country. Currently performing with their five star lineup, Fleetwood Mac will be joined by returning songbird Christine McVie following a 16 year absence. Due to phenomenal demand the band have today announced four additional arena shows in London, Birmingham, Leeds and Glasgow! The European leg will begin on 27th May and run through to the most recent show addition on Wed the 8th of July. Tickets for new shows are on-sale 9am on Thursday 4th December from www.livenation.co.uk. During Fleetwood Mac’s 2013 tour, the four members happily welcomed Christine back on the stage during their show at London’s The O2, where she performed their classic “Don’t Stop” and received a wild ovation from the crowd. “It was so comfortable being back onstage with them as if no time had passed, and then we all started talking and it feels like the time is right. I’m really happy,” she commented. “As far as we’re concerned, she’s never really left. We are overjoyed to have Christine back on stage with us,” said the other members of Fleetwood Mac in a joint statement. 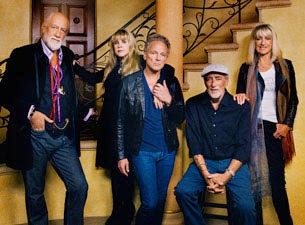 Please check www.fleetwoodmac.com for the latest information on the band, tour and ticketing.